In my last essay “Strategic Thinking for Startups” I mentioned the Network effect enjoyed by Microsoft. 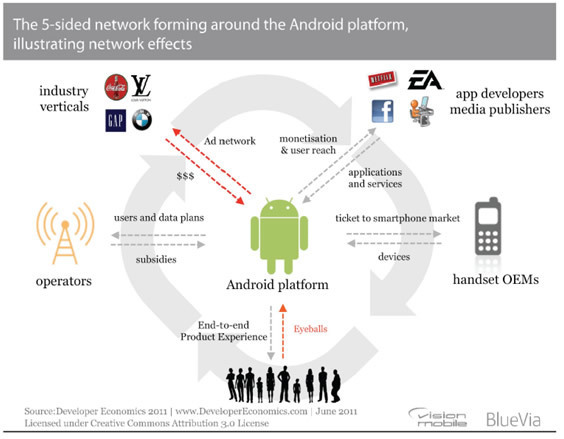 This got me interested about the business models where Network Effect is prominent- Multi-Sided Platforms (MSP). This business model is becoming more and more relevant as we are moving towards a sharing economy where resources are shared by multiple users making optimum use of resources viable (arguably). Popularity of the MSP is partly attributable to explosive growth prospects. (Refer to the fig. 1). Some successful Multi-Sided Platforms are Facebook, Google, PayPal, Amazon Marketplace, Alibaba, Microsoft Windows and in recent times Airbnb and Uber. But, as a concept MSP is not new at all. Think about Shopping Malls – which provides a platform for the buyers and sellers. My foremost goal is in this essay to explore the nuances of the Multi Sided Network and understand how it creates economic value to the investors. In other words, I want to understand what factors an investor should consider before making an investment in this kind of business. 1. What is a Multi-Sided Network? It is an economic platform with multiple user groups that provide each other with network benefits. For example, in Fig. 2. we can see the 5-sided Platform of Android. They enable direct interactions between two or more distinct sides. Each side is affiliated with the platform. The first point is associated with the level of control the Platform owner has on the interaction between different groups. If the platform owner controls interactions, then it is not an MSP but a vertically integrated firm. MSPs do not control, but govern the interactions. So, Consulting Firms who control the interaction between the consultants and clients are not MSPs, nor the Taxi companies who control the payments. 2. What is Network Effect? Goods and services become more valuable when more people use them. For example, when more and more of your acquaintances sign up on Facebook, value of Facebook increases for you. In case of Multi-Sided Platform the case is little more complex because there is more than one type of group. In case of Facebook (refer Fig. 3.) There are three types of participants – Users, Developers and Marketers. Users and Developers enjoy a positive network effect. When there are more games and apps available, more users and sign up and spend more time on Facebook. More users encourage the developers to develop games and apps on the Facebook platform. The third participant, Marketers can have a negative network effect. Unplanned and excessive advertisement can discourage users. That is why Facebook uses a bidding process for the ads to minimize the negative effect (Facebook Inc., 2015). Nerdy references apart, SIPOC is a Six Sigma tool generally used for process mapping (ASQ, 2015). However, I found that it is surprisingly useful to analyze Business Economics. It is especially helpful to understand the relationship with the suppliers and customers of complex operations. As we can see in Fig. 3. in the case of Facebook the suppliers are the users and the content they get from the platform is free. The content in this case is user demography, location, behavioral data etc. Facebook uses this content to generate analytics and the Marketers can place their ads based the user data. Developers on the other hand, pay Facebook to place their games and apps on the platform. Facebook also helps the developers with various APIs, plugins and online payment infrastructure (very similar to Amazon Marketplace). 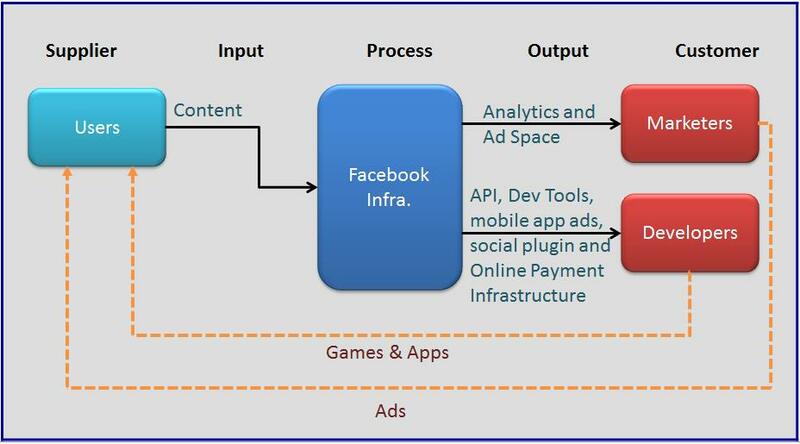 Facebook also helps the developers monetize their apps (Facebook Inc., 2014, pp. 5-6). One thing we need to understand that in case of Multi-sided Platforms active user volume is the most important factor. Anyone who wants to develop an MSP must spend time to build a critical mass and that is not easy because no one wants to join without other side in place (Brokaw, 2014). Consider Amazon Marketplace, no seller would want to join without any buyer subscribing to the website and without any seller buyers visit to the website is meaningless. At the beginning (after the failure of Auction and zShops) Amazon sold their own inventory through the Marketplace, which attracted some buyers. Then they opened up the platform for third party sellers, which attracted more buyers (Amazon.com, 2014, p. 1). A rush to monetization may cost you your whole endeavor. Realization of profitability and positive cash flow takes some time. For example, Alibaba.com posted a positive cash flow at the end of 2002, 3 years after starting their operation in 1999 (Alibaba.com, 2015), Facebook turned a positive cash flow in 2009, 5 years after it started its operation (Chan, 2009). Understanding the drivers for revenue and cost is very helpful for an investor who wants to value the business or wants to understand the future direction of the business. Otherwise the valuation may get limited to an arbitrary valuation with random comparable companies. Social networks measure operational success through metrics such as Daily Active Users (DAU), Monthly Active Users (MAU) etc. For a systematic analysis let us consider the components of Revenue and Cost for MSPs. Number of users signify the success of the platform in creating loyal participants. Now, what decides Number of Users? First of all, type of platform. If we have a general or multi-purpose platform, it will be possible to attract user volume. Facebook is a general platform where users can create their own specialized groups. More specialization reduces the number of potential users. For example, LinkedIn is customized for the professionals and limits the potential users. This concept of potential users is important in deciding the revenue streams of the MSP. Facebook’s success in attracting a large number of users of varied demography makes it possible for Facebook to depend solely on Advertising revenue and fees from developers. On the other hand, a customized platform LinkedIn charges subscription fees for some facilities. Microblogging platform Twitter has limitations on what people can do on the site. Its struggle with monetization can be attributed to its limited potential user base and impracticality of a subscription model (although Twitter sell metadata to Analytics companies though Firehose – another source of revenue). Recently we have seen that the other Platforms are trying to adapt some features of Facebook, namely – ability to add media on LinkedIn and Twitter’s video upload. One factor that can have a detrimental effect on active users is higher percentage of advertisements in the news feed. One of the reasons for failure of Myspace was its dependence solely on advertising money and ungoverned feed of advertisements (Gillette, 2011). ARPU shows the platform owners ability to monetize. Fig.5 shows a comparison between the ARPU of Google, Facebook and Twitter. The large difference in ARPU between Google and Facebook is attributed to the fact that ads on search results are more likely to be clicked than display ads and fetch more advertisement revenue (Blanding, 2013). Geography is another major factor which influences ARPU. 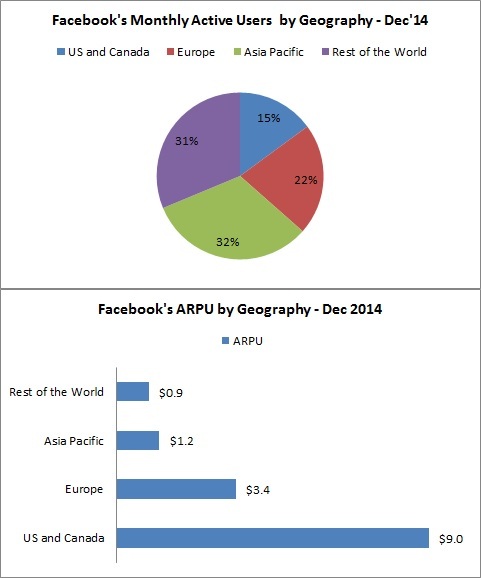 Facebook’s ARPU is considerably higher in North America, then in Europe (Refer Fig. 6). These regions have a matured advertisement market, higher per capita income and higher internet penetration. But, user growth in other geographies is important for future growth- especially the high growth in developing countries. Ability to monetize the platform depends on the ability to discover and create various different revenue streams. Google’s various interconnected products – Google Search, Google Map, YouTube, Google Finance etc. makes it possible to attract and engage different groups of users and hence earn revenue from different kind of marketers. The next important factor is user engagement. The time users spend on your platform is important criteria for marketers to decide on ad placement and the weighing the fee involved. This is why MSPs such as Facebook, Google and LinkedIn keep on adding more and more features to their free platform – they are fighting over your time. The games and apps by developers have a positive network effect in this respect. They encourage users to spend more time on the platform. Another factor is the compatibility of the platform with electronic devices. 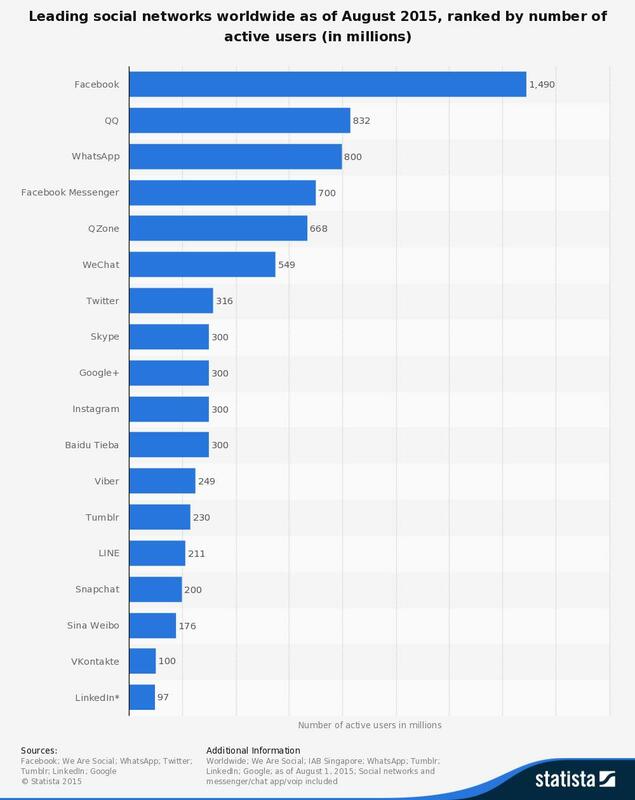 New mobile devices are being introduced frequently and people are accessing the internet from these devices (Facebook Inc., 2014). The above factors deal with ARPU on a high level. But, revenue is generated through making sales on the ground level. A distributed and effective sales network is critically important for any business and MSPs are not exceptions. Please refer to my Facebook example, in Fig.3. Facebook’s major input – content comes free. Google on the other hand pays some fee for the contents in YouTube and Google Play (Google Inc., 2014, p. 51). So, the inventory cost (or Product Cost) for these MSPs is either zero or negligible. Most Cost of Revenue is associated with the Period Costs – leasing of Data centers, depreciation of the owned infrastructure, salaries etc. But, we need to be careful about the research and development costs. Technology changes quickly and a considerable amount of R&D is required to keep up. According to IFRS guidelines (IAS 38.54) most companies expense their research cost immediately (Facebook Inc., 2014, p. 41). Also a fast growth in the user base necessitates large capital investments. Note: I want to take a slight detour here. Are Apple, Facebook, Google and Microsoft comparable companies for valuation purposes? My view on this is that they are not comparable companies. Apple and Microsoft are matured companies and have their fingers in a lot of pies. But we need to understand that Apple and Facebook are not in the same business and do not make money in the same way. Apple is predominantly a product company who is trying to form MSPs with Apple Music, Apple Pay etc. 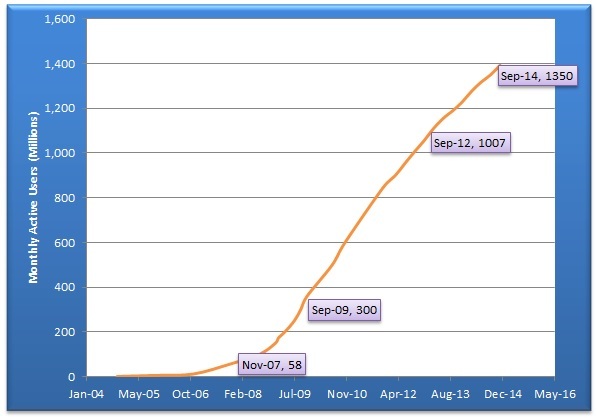 Though, Microsoft used MSP model early on, and benefited hugely from it, it does not earn advertising revenues. 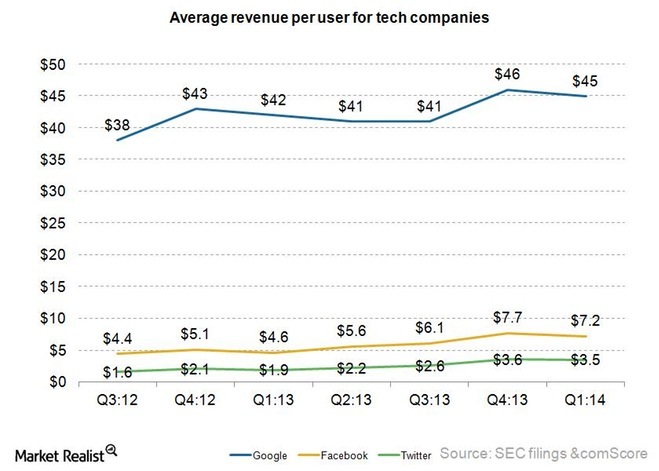 On the other hand, Facebook and Google are extremely dependent on the advertising revenue. In 2014, 92% of Facebook’s revenue came from advertisements (Facebook Inc., 2014, p. 62). One of the major barriers in acquiring new users is low internet penetration and insufficiency of high speed internet in the developing countries. Both Google (Project Loon) and Facebook (Internet.org) are trying to bring more people on the internet. Why? As Google puts it “Fast search and high-quality ads matter only if you have access to the Internet” (Google Inc., 2014, p. 4). This will enable moving advertisements from more traditional modes (Newspaper, Television etc.) to online platforms. Data Protection, Privacy and Intellectual Property are major legal frontiers for MSPs. The European Commission is in the process of developing a harmonized Data Protection Directive which may necessitate major investments and/or penalties (Facebook Inc., 2014, p. 7). Also, MSPs are frequently faced with cases concerning right to privacy. Personal and behavioral data of users are the basic raw material for the MSPs. Any regulation limiting the ability to collect and/or retain the information will have a material effect on the value of these companies. Most MSPs depend on new apps and services to attract and engage users. It is a fast changing industry, which requires continuous innovation. That is why these companies are exposed to legal challenges linked to intellectual property rights. Facebook, Google, Tumblr, WordPress etc. MSP’s earn revenue through advertising. Recently an array of ad blocking software has been introduced in the market. Apple included an ad blocker in recently introduced iOS 9. This poses a direct threat for the revenue stream of the MSPs. Amazon.com. (2014). Annual Report 2014. Amazon.com. Facebook Inc. (2014). Facebook Annual Report 2014. Delaware: Facebook Inc.
Google Inc. (2014). Annual Report 2014. Delaware: Google inc.
Hagiu, A., & Wright, J. (2015, March 16). Multi-Sided Platforms. Working Paper . Harvard Business School.